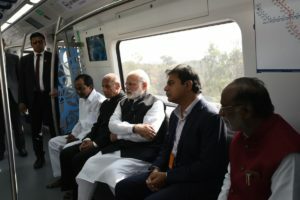 Prime Minister Narendra Modi on Tuesday inaugurated the first leg of the Hyderabad Metro rail project from Miyapur rail station. The first phase of the project, measuring 30 km between Miyapur and Nagole, involves 24 stations. Its commercial operations will commence from tomorrow onwards. The Prime Minister today undertook the first ride along with Telangana Chief Minister K Chandrashekhar Rao and the Governor E. S. L. Narasimhan. Hyderabad metro project is the world’s largest public-private-partnership (PPP) in the sector. After inaugurating and travelling in the Hyderabad Metro, Modi reached the helipad at Miyapur for going to attend the Global Entrepreneurship Summit. People can use this Metro train between 6 am till 10 pm, which is likely to be rescheduled to 5.30 am to 11 pm by the Hyderabad Metro. The minimum fare Rs 10 is for travelling up to two kilometers while the maximum fare is Rs 60 for travelling over 26 km. There is also facility of Rs 200 prepaid card for residents. Each train comprises three coaches, each can accommodate 330 passengers. The Prime Minister also launched mobile app ‘TSavaari’. The app will provide a comprehensive transport solution, with information on all modes of transport for a journey if it is a TSRTC bus, MMTS train, and metro trains. Meanwhile, earlier in the day, US President Donald Trump’s daughter and advisor Ivanka Trump arrived in Hyderabad to participate in the three-day Global Entrepreneurship Summit. Telangana IT secretary Jayesh Ranjan and US Ambassador to India Kenneth Juster received here at the Rajiv Gandhi International Airport. Leading a high-level delegation of American women entrepreneurs, Ivanka will address the Global Entrepreneurship Summit, following its inauguration by Prime Minister Narendra Modi. She will later attend a dinner hosted by the prime minister at the Taj Falaknuma Palace. The Hitec City area and Hyderabad International Convention Centre, where the event is being organised are being by nearly 10,000 security personnel, including commandos, special police, and civil police guarding the roads, hotels and the venue.